Interference competition can profoundly influence the outcome of species interactions and may lead to either coexistence or exclusion. Our understanding of how interference can lead to coexistence remains incomplete, particularly when interference fails to result in resource partitioning. 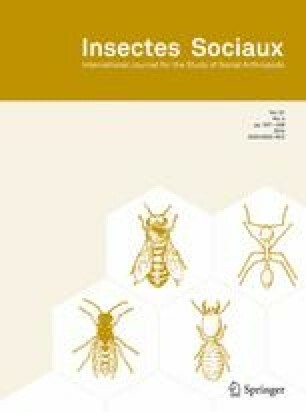 I document a novel form of interference competition between an ant (Myrmecia pyriformis) and a social spider (Delena cancerides) with similar foraging patterns. Of 120 nest boxes occupied by D. cancerides in the field, 7 (6 %) were invaded by M. pyriformis ants over a 2-month period. After eliminating spiders from the nest boxes, the ants proceeded to fill the boxes with debris, rendering them useless to the spiders. The ants do not occupy the nest boxes; thus, interference occurs at a resource that is necessary to one species, but not the other. I discuss how further research into this system may improve our understanding of how interference competition can support coexistence. I also suggest modeling exploitation and interference competition on multiple resources to align with this and other empirical examples where different forms of competition occur for different resources. Funding was provided by the NSF Graduate Research Fellowship and the Liu Memorial Fund. I thank Dr. David Rowell, who hosted me at The Australian National University while conducting this research. I also thank Alan Muir for help in nest box construction and Dr. Ajay Narendra for bulldog ant identification. I thank Drs. Yael Lubin and Linda Rayor and two anonymous reviewers for their thoughtful comments on the manuscript.